You will love IH Aberdeen -a small, friendly school. It has around 70 students and everyone soon knows your name. The staff take time to get to know you, listen to you, help you and teach you. Students are aged between 18-60, many preparing for entry to university, especially Robert Gordon and Aberdeen universities. You’ll be in a small class (on average 10 students) so you learn English faster. You get to know people quickly, and make lots of friends which makes studying more fun. Located in the north east of Scotland, Aberdeen is an excellent destination to experience the real Scotland. Aberdeen is a prosperous city of around 300,000 inhabitants and home to 2 world class universities. It’s a small friendly and lively city, offering a year-long calendar of festivals and events and you will be able to enjoy great shopping, beaches, parks, theatres, cinemas, and a vibrant nightlife. Just 30 minutes of Aberdeen city centre, you can reach the beautiful landscapes Scotland is famous for: hills, mountains, beautiful wildlife, dramatic coastlines and ancient castles are all within easy reach. As such, Aberdeen is a great base for all outdoor sports, such as golf, hill-walking, and mountain biking. Many students come especially to prepare for entry to universities. IELTS courses are aimed students who wish to study at British universities. These classes prepare you to pass IELTS examinations successfully. - Learn exam techniques to help you pass your exams with success! Recognised all over the world, you can use the *FCE exam (First Certificate in English) for university entry or to enhance your CV. IH Aberdeen is an approved University of Cambridge ESOL exam centre, so at the end of your course you can sit the FCE exam at IH Aberdeen. You will attend General English classes in the mornings then FCE classes in the afternoons. You will develop your general English and communication skills for 3 hours every day. Natural English: You will get lots of opportunity to practise your speaking skills, learn English for everyday, practical situations and learn about life in the UK. No exams, no grammar, no coursebooks – just lots of practice! You will learn English for everyday, practical situations and have fun with quizzes and games. Sometimes you will go outside the school to practise what you have learned. No exams, no grammar, no coursebooks – just lots of practice! • to speak more fluently and sound more natural in English! One to one: You can have one-to-one classes for whatever you need – please contact us for your requirements, we will be delighted to help. Homestay – (All year round) We can arrange homestay accommodation (with meals or self catering) in a friendly local Scottish host family, so you have the opportunity to practise English and learn more about the Scottish way of life. 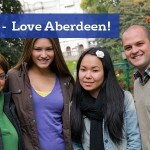 All homestay families live within 30 mins of IH Aberdeen. Residence – (summer only) we can arrange accommodation at a student residence in Aberdeen. Rooms are all single with shared kitchens and bathrooms (en suite rooms available on request). All residence rooms have wi-fi and are within a short distance of the school. We can arrange transfers from/to Aberdeen International Airport. Price on application. You can go on a different outing every weekend – many free or low cost – to experience as much of Scotland as possible while you improve your English. You can also enjoy a range of social activities at lunchtimes, after school and at the weekends. - Visits to some of Scotland’s most beautiful and romantic castles including Balmoral, which still used by Queen Elizabeth, and Dunnottar Castle, where Hamlet was filmed. - Day trips to places like Loch Ness, St Andrew’s (the birth place of golf and where Prince William met Kate Middleton) and Dundee (where you can follow in the footsteps of Captain Scott of the Antarctic). - Outings to the Highland Games and the Edinburgh Festival (summer only). - Walking tours to explore Aberdeen and the beautiful Scottish countryside, including trips to the stunning Cairngorms, and Forvie Sands Nature Reserve to see the seals. - Whisky tasting at Aberdeenshire’s whisky distilleries where you will also see it being made. - Fantastic fun and Scottish dancing at Ceilidhs (pronounced 'kei-lee'), the traditional Scottish country-dance parties. - Pub nights: sample local beers and meet friendly local people at traditional Scottish pubs. - Live music concerts (modern and classical). - Visits to museums and galleries. - Sporting activities such as indoor football, bowling, and golf.